huh. yesterday's post was my 950th! wow, i'm a chatty mofo. as if that's news. heh. i actually have a shitton of stuff to recap from my weekend (including a fabby birthday party and glee live! ), but i got so distracted yesterday with all sorts of fun stuff going on that i didn't get a chance to upload the zillion photos. no worries, though. but i did manage to pull it together and make dinner last night. we went out so much over the last couple of weeks that i'm determined to get back to our cost-cutting ways and dine at home as often as possible again. 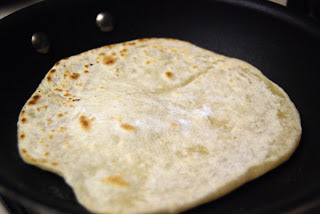 i've been browsing recipes for homemade tortillas on and off, and when i came across a super easy one in taste of home magazine this weekend, i decided to give it a shot. there were all of about four or five ingredients in it, but i still managed to eff it up somehow. 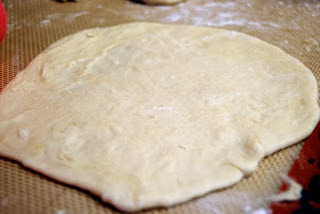 i just googled for a recipe to link for you and came across this post in the magazine's online forums from someone who had the same problem i did, which was that the dough was far too soft and sticky to knead and shape properly. i kept adding flour to it, but i still ended up with a good portion of it stuck to my hands. but i was determined - having decided to mix up a batch of creamy black bean burrito mix for the teen's dinner - so i forged ahead. i was finally able to shape the gooey dough and roll them out into some semblance of a tortilla shape - if tortillas weren't round, anyway. i plopped it into my now-hot pan and watched it puff up and brown. hey, it looks like a tortilla, right? but because i couldn't get them to roll out properly, i ended up with some pretty thick, almost pancake-like tortillas. FAIL. or so i thought. the hub declared them a win - "i like these, they're thick and chewy!" - and the teen slathered her burrito filling on top and ate it like an open-faced sandwich. maybe i'm not a tortilla failure after all. as for me and the hub, i decided to give this recipe for pork tenderloin in sour cream sauce a shot. 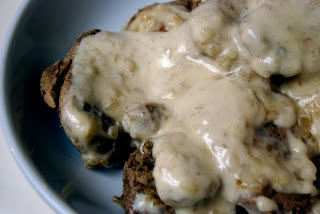 it turned out really tasty, although it looks like a "g-nasty mess," as the teen put it. well, i'm not really known for my presentation skills anyway. so back to the tortillas - is it super lame to put in all that effort to recreate something that i can buy a whole bag of for, like, $.98 at fresh & easy? dang. 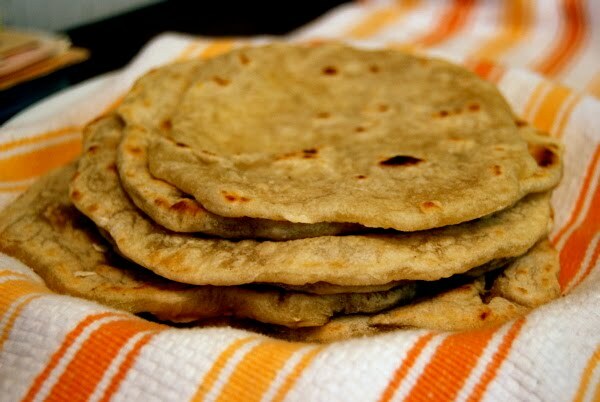 fresh tortillas are the best. but i just go to a bodega or carniceria and see if they have any. lazy tater. More like a soft tostada! Dude - so long as it tastes good, who cares if they're a little mishapen or thick. They sound yummy to me!